With that in mind, and from my own experience teaching college theory at Harvard and UCLA in its School of Music, I wanted my 5 year-old daughter to have the best possible access to musical teaching, training and experience using the computer as a tool – since I didn’t have Nadia Boulanger! I was also interested to see what had been developed using technology, so I made a point of trying everything I could find. Luckily I found MusIQ HomeSchool’s Children’s Music Journey, which is the single best music tutor, and music ‘experiencer’ for kids that I’ve found. There are a number of reasons why – the program is planned carefully, it moves in steps that kids can relate to, and it’s clever in finding many different ways to teach aspects of musicianship – but the main reason it works so well is that my daughter has a real affection for it, and for the parade of famous composer-teachers who became her tutors, a small but ultimately brilliant device that the program uses to deliver its lessons. These CMJ composers can be pretty humorous, listening to their own music with rapt attention, hands to their chins and staring skywards, and while it might seem odd that none have German, French, English or Russian accents – not even Beethoven! – they’re endearing and inviting, and so friendly that even small children are charmed. And those children also learn a lot, very quickly – each composer’s work is sampled and given a thumbnail explanation before the lesson starts, so the child knows that the journey is always about music, and how to make it, at a high level – in fact, at an artistic level. So CMJ does not talk down to kids, as most programs do, it elevates them and opens a door to experience. It also creates a relationship that kids want to continue living and working in – the most important aspect of a music training program which, if it’s going to work at all, needs to have the child coming back again and again. In our own case, my daughter finished CMJ I at age five, and Volume II a year and a half later when it was released (we were impatient for each further installment). With CMJ Volume III, she worked through several sessions, and then announced she wanted to repeat the entire program again, so we went back – and this was her choice alone. Now we’re back in CMJ III again, with a very solid foundation for everything it offers, forging ahead. 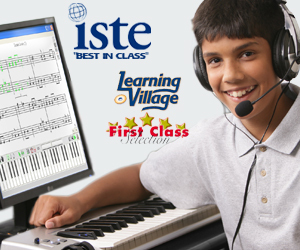 The program isn’t completely automatic – it’s good for a parent or teacher to be nearby to help with the technology, and help navigate the program’s many choices (including clever musical games and a recording studio, my daughter’s favorite), but that’s only to smooth the way for the kid to go deep into their own experience of it. So we’ve been working with CMJ for over three years now, and wish there were more installments ready when we finish CMJ III. But there’s no hurry – taking your time, working through lessons and practicing, trying to do better at the game challenges, is all part of learning and of learning music – building habits any child will find useful in other aspects of eduction. Does music make kids smarter? Absolutely – everything in my experience tells me so. I know the kids I went to music school with were, and are, some of the most brilliant and accomplished people I’ve ever met, and I can’t believe it’s an accident. The Greeks taught music as one of the three main courses of their ‘gymnasium,’ and again and again I’ve heard stories of musically accomplished teens getting accepted at top colleges and universities after demonstrating their skills. Educators know it takes discipline and self-starting dedication to master an instrument, making music a great indicator of success on every level in college.